The first-ever U.S. Department of Commerce Education Mission to Brazil,taking place this week (August 30-Sept. 6), represents an important opportunity to further strengthen cultural and economic ties between our nations. As the largest education mission our agency has organized to any country, I am both honored to lead this mission and enthusiastic about connecting U.S. higher learning institutions with Brazilian students seeking study opportunities in the United States. During the mission, representatives from 66 accredited U.S. academic institutions will showcase their undergraduate, graduate, community college and intensive English language programs at Education Fairs in Brasilia, São Paulo, and Rio de Janeiro. We appreciate the leadership of U.S. 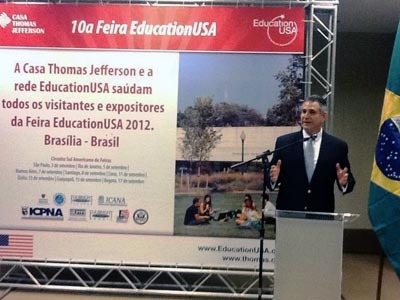 Ambassador Thomas A. Shannon, Jr., and the U.S. Embassy in Brazil in providing strong support for this education mission as well as their longstanding efforts to promote educational exchanges between our countries. As Brazil works to expand educational opportunities for its professional workforce, we applaud the leadership of President Dilma Rousseff, and her country’s ambitious goal of sending 101,000 Brazilian students in science and technology fields overseas in the next four years, through her visionary initiative, Science without Borders (SWB). We look forward to working with the Government of Brazil in achieving success in this nationwide scholarship program to promote higher education abroad. Within SWB, there are 75,000 scholarships funded by the Government of Brazil and 26,000 scholarships funded by the private sector. We want to see many of these future students in one of our exceptional educational institutions in the United States. At the beginning of the SWB program in 2012, there were 500 Brazilian undergraduate students placed in U.S. schools, followed by an additional 1,400 students later this year. By the end of 2013, there will be 1,500 Brazilian Ph.D. students in U.S. universities. The benefits to Brazil are numerous. There are inspiring examples of U.S.-educated Brazilian professionals who have returned to their country to strengthen development and innovation in Brazil. For example, Minister of Science, Technology, and Innovation Marco Antônio Raupp earned his Ph.D. in mathematics from the University of Chicago. The Institute of International Education (IIE) reports that there were more than 9,000 Brazilians studying in the U.S. in the 201/12 academic year, a 25 percent increase from five years earlier, placing Brazil 14th among all countries with international students in the United States. Beyond that, IIE reports there are more international students (more than 723,000) in the United States than anywhere else. President Obama— as demonstrated through the United States’100,000 Strong in the Americas initiative—shares a commitment with President Rousseff on the need to build partnerships that address the needs of a 21st century workforce. Brazil is an important partner in this effort, and these initiatives are expected to lead to even greater educational and cultural ties between our countries. I look forward to spending time in Brazil with the members of the education mission, and advancing the goal of opening new doors to educational opportunity and collaboration. By expanding the avenues to higher learning, we will make a longstanding contribution to future generations who hold the key to continuing our shared prosperity.